Learn to fish and share your knowledge with others. Subscribe to keep up to date on the Besadny Anadromous Fisheries Facility. The following information is the salmon and trout processing information for our facility on the Kewaunee River. We will post new information to this site every TUESDAY at 4:00 pm from March through April and October through early November. Depending on water conditions and number of fish in the weir, fish are usually processed on Wednesdays. In addition, you can read the latest fishing report on our Lake Michigan Outdoor Report page. 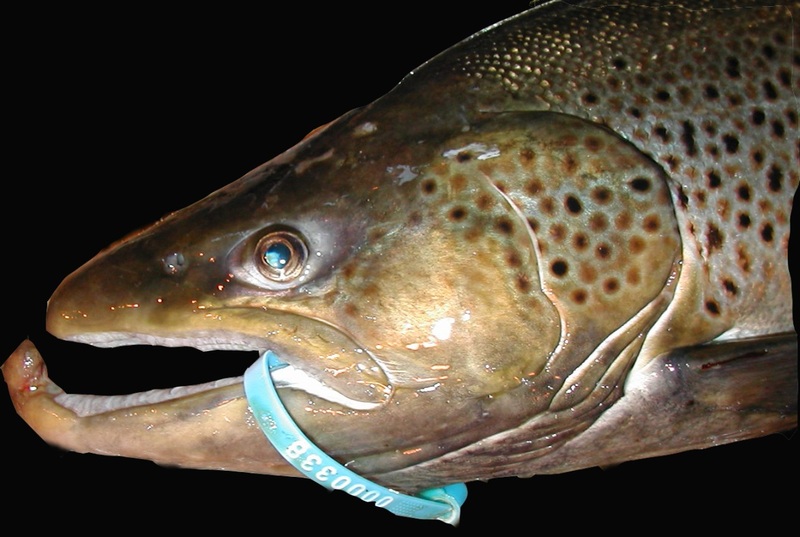 BAFF seeforellen gamete collection – Seeforellen brown trout are the only wild strain of brown trout that are stocked into Wisconsin's Great Lakes. Beginning in late October, WDNR crews use electroshocking boats on several rivers on Lake Michigan to collect seeforellen adults that are identified by a unique fin clip. Adult seeforellen are transferred to Besadny Anadromous Fish Facility where they are held in ponds. Once a week from, mid-November to mid-December, staff collect eggs and milt from ripe adults. Fertilized eggs are transferred to the Wild Rose Hatchery. Fish that are not yet ready to spawn are returned to the ponds to be spawned at a later date until the goal of 1 million eggs is collected. Each year, approximately 400,000 seeforellen are stocked into Wisconsin waters of Lake Michigan (300,000) and Lake Superior (100,000). History of the seeforellen strain in Wisconsin: The first seeforellen browntrout were stocked in Wisconsin in 1991. WDNR obtained eggs from New York in late 1989-early 1990. The goal was to promote an extended trophy fishery, as seeforellen tend to live a year or two longer and spawn a month or two later in the fall compared to domestic strains of brown trout. The current Wisconsin state record brown trout for outlying waters is a 41 lb. 8 ounce seeforellen that was caught in southern Lake Michigan near Racine in 2010 by Roger Hellen. Muskellunge - Since 2010, Wisconsin DNR has worked cooperatively with Kewaunee County to raise Great Lakes Spotted Musky at Dana Farm. 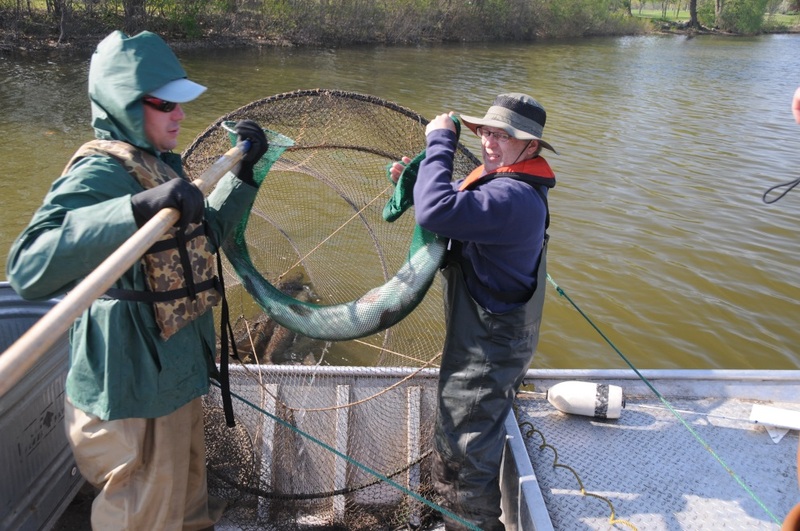 Each May, nets are set in the Fox River to capture spawning Musky. The captured Musky are measured, weighed, checked for a fin clip and a PIT Tag, spawned and released back into the Fox River. Fertilized eggs are disinfected, water hardened and transported to Dana Farm. In a small building next to the hill pond, eggs are placed in hatching jars and allowed to hatch. Following hatching, Musky are held in the building until they have consumed their yolk sac and then are stocked into the outdoor ponds. While in these ponds, Musky are fed bait fish by the truckload causing rapid growth. By the end of September, they average nearly 12 inches in length. At this time, the Musky are seined from the ponds, fin clipped to denote they were stocked as fingerling, loaded into trucks and hauled to stocking locations around the Bay. 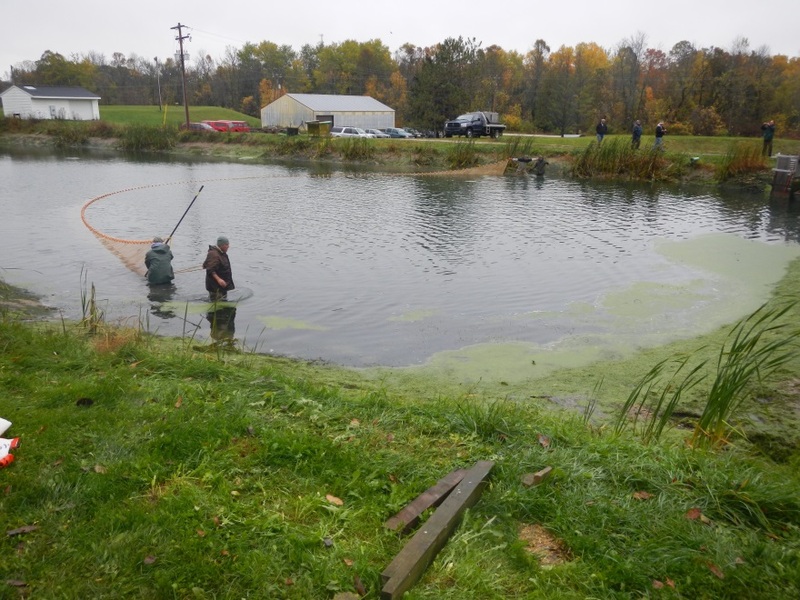 The hill pond has been in use since 2010, while a newly renovated road pond produced its first Musky in 2015. The renovation of the road pond was achieved through the generous donations of many Musky clubs and the cooperation of DNR and Kewaunee County. These ponds will continue to raise Musky for stocking into Green Bay until either a peer reviewed disinfection protocol is developed allowing fish to be safely moved from the Fox River to Wild Rose Hatchery or the inland brood lakes produce disease free eggs in sufficient numbers needed to support the program. 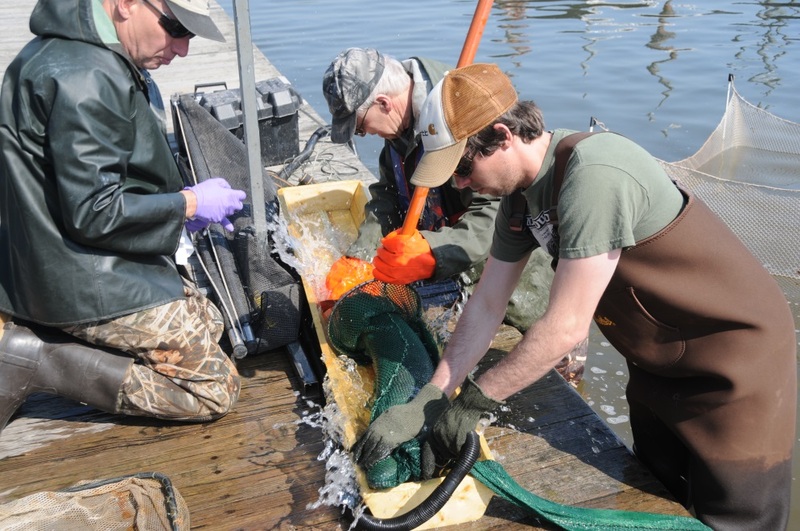 Two steelhead rainbow trout processing days have occurred this spring (2019) on the Kewaunee River at the Besadny Anadromous Fisheries Facility (BAFF) on April 1 and 8. Numbers of new steelhead processed each day respectively were 206 and 211 (total 417). These steelhead were sorted by genetic strain, with Chambers Creek and Ganaraska kept in holding ponds for upcoming egg collections. The first egg collection at BAFF is scheduled for Wednesday April 10. Fish are not being passed upstream of the dam, but instead are released down at the harbor.